Of course you want to see the great icons. We understand. They’re iconic for a reason. Machu Picchu is rightfully entrenched in travelers’ minds as a must-see locale because it’s an incredible place to experience. But it’s far from the only awe-inspiring historic site in Peru, simply the best known. So if you’re ready to dig into some of Peru’s less explored and underappreciated sites, you’re going to find yourself pleasantly surprised by the bounty of fascinating and mythical ancient treasures waiting to be properly appreciated in the northern regions of the country. Pre-Hispanic northern Peru was a thriving part of the world in its own right. Legend has it that in ancient times, a great float of balsa rafts carrying a procession of nine warriors arrived on the beaches of pre-Incan northern Peru. The float was said to have been led by Naymlap, the mythical founder of the northwest civilization. Among his descendants were the Moche culture. They would build a great civilization in the Chicama and Trujillo Valleys, their state eventually covering an area from the Huarmey Valley in the south to the Piura Valley in the north, accumulating such wealth and power that they established themselves as one of the most unique and important early-Andean cultures. While the debate continues among archaeologists to this day, for the most part it is now believed that the Moche culture eventually evolved in the Sican culture, who would look to a now seemingly obscure stretch of plainlands between the Andes and the Pacific Ocean – the Lambayeque Valley – to build one of the largest and most significant groupings of ancient pyramids in the world; Túcume. This sweeping 540-acre historic site contains some 26 major pyramids and platforms. Through the centuries the Sican, the Chimu civilization, and eventually the conquering Incas all contributed to the building of Túcume. Despite its multicultural history and pre-historic relevance, Túcume went relatively unstudied until the late 1980s, at which point the famous ethnographer Thor Heyerdahl and his team began unearthing a number of significant artifacts from the site. 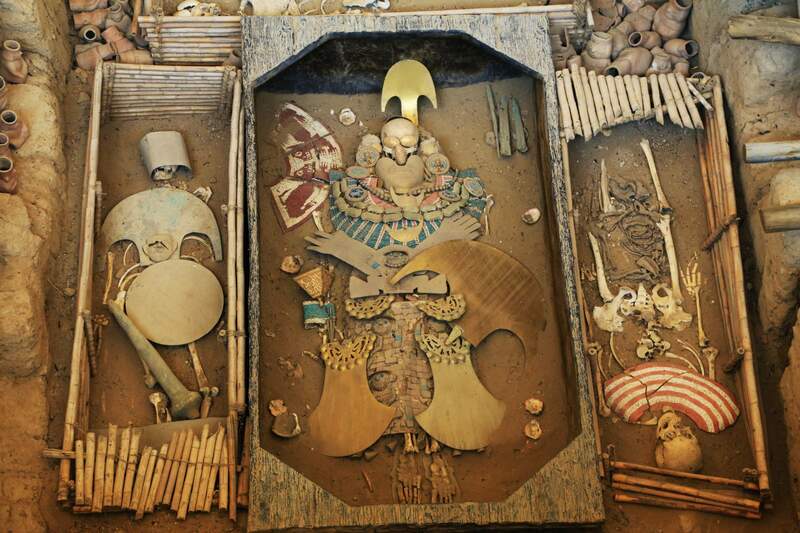 Among the discoveries made by Heyerdahl was the Lord of Sipan tomb, with its collections of gold, masks, jewelry, scepters and hundreds of ceramic pieces. The tomb is the richest ever found in the Western Hemisphere and its importance has been compared to that of Egypt's Tomb of Tutankhamen. Intrepid traveler’s eager to go a little off the beaten track can visit the tomb today in the Royal Tombs of Sipan Museum as part of our four-day trip extension Peru North, which also includes a visit to the UNESCO World Heritage site of Chan Chan, the capital of the Chimu civilization, among a variety of other fascinating historic temples and sites from this often overlooked historic region. It may not be the most well-known site Peru has to offer, but the stories it holds, the civilizations that have called it home, and the plethora of treasures unearthed in northern Peru make it an incredible find for travelers looking to take a deeper step into the rich and mystical history of some of South America’s most astonishing ancient civilizations.